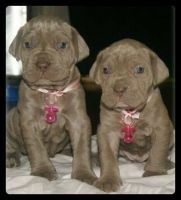 Neapolitan Mastiff breeders links and breed information on pups4sale.com.au. pups4sale testimonial: Just a short note to say once again thank you, this is the only site I use for my puppy ads and all my little Jacks have gone to wonderful homes all over Australia. The large breed known as the Neapolitan Mastiff is known for its big build, loose skin and its guard dog abilities. What many people don't know is that it is an ancient breed, but it came close to extinction in the early 1940s. 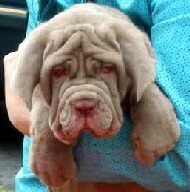 Luckily, some people in Italy saw how great the Neapolitan Mastiff was and made sure to keep them around. Nowadays, the Neapolitan Mastiff is one of the best guard dogs around and also a good family pet when it is paired with the right people. They are patient with both adults and children and, while they aren't necessarily lazy, they are happy to lay around with their families all day long. 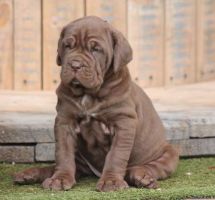 Thanks to Wild Child Neapolitan Mastiff Kennels for the pictures of Neapolitan Mastiff puppies & adults used on this page, and the additional information provided. It's very common for Neapolitan Mastiffs to shock people when they first see one because they have a huge body and an even bigger head. On top of that, they have an intimidating state and the loose skin on their face can sometimes look a bit scarier than other breeds. Of course, that definitely doesn't tell the whole story about the breed, but it was intentionally done over 4000 years ago by people who wanted to scare off intruders.Male Neapolitan Mastiffs can grow to be 27 inches or taller and can weight upwards of 200 pounds. Females usually grow to be an inch or two shorter than males and weigh anywhere from 125 to 175 pounds.Neapolitan Mastiffs have a thick skin and a dense, short coat that is even in length from head to tail. They have extra skin on their heads that keeps them warm during the cooler months, but it does not affect their eyesight. The coat is usually a dark gray, but can sometimes be other dark colors. By nature, Neapolitan Mastiffs are loyal to their owners and are courageous as dogs come. They also are intelligent and confident, which makes them tougher dogs to train, but amazing pets when brought up correctly.Neapolitan Mastiff puppies grow very quickly, which is why owners have to take extra precautions to make sure that their homes are doggy-proofed. They are slower puppies, but their size can make them destroy bigger items than most other puppies.With children, Neapolitan Mastiffs are great dogs as long as they are socialized at an early age. They may be big, but they are also quite calm around children and are not know for being too aggressive while playing. However, they are still very big dogs, so parents should always supervise their kids when they are around this breed.Neapolitan Mastiffs are the type of dogs that love to chase other dogs when they are playing. When they are properly socialized at a young age, Neapolitan Mastiffs aren't aggressive at all with dogs of any size.Neapolitan Mastiffs are some of the best guard dogs in the world because they are deeply loyal to their owners and they were originally bred to knock down and hold intruders. They have a very good understanding of who is a friend of the family and who is someone they shouldn't trust.Neapolitan Mastiffs can become very attached to their owners, which can be tough on them when they are left alone. This is why it is recommended that they are crate trained when they are younger so they learn be independent dogs. Otherwise, they can wreak havoc on a home if they become anxious. Neapolitan Mastiffs are intelligent, but they are also very big dogs from a young age. This means that training needs to start early on so they can quickly respond to their owners before they break anything in or around the house.Owners who take on the task of teaching their Neapolitan Mastiffs commands will quickly see that they are a bit stubborn because they want to be dominant. Once the owner shows the dog that he or she is in control, training can be quite easy with this breed. 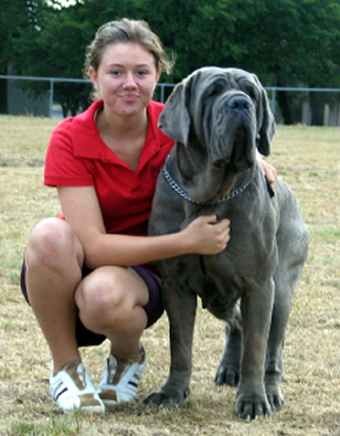 As long as the trainer is positive yet firm, a Neapolitan Mastiff can be a good student.An interesting thing about Neapolitan Mastiffs is that they do not have to be trained extensively when it comes to their guard dog responsibilities. In fact, because they have an instinct to protect their family, any additional training may cause them to be overly protective, which can lead to problems. Neapolitan Mastiffs are a bit more clumsy and a little bit more uncoordinated than other breeds, so it's important that they don't run around as much as other breeds. It's okay for them to run around a little bit, but they can hurt themselves easily if they lose balance or jump around too much.A daily walk is all it takes to keep a Neapolitan Mastiff in good shape. Even though it might seems like this breed needs to work out a lot to keep healthy, they actually need far less than most other breeds. As long as they have room to roam around and get their daily exercise, they are generally happy pets. Neapolitan Mastiffs don't have extensive grooming needs, but they do have a few unique needs that all potential owners should know about. In an average week, Neapolitan Mastiff owners should set aside an hour or so for groom their dogs.The one thing that all Neapolitan Mastiffs do a lot of is drooling. They will drool after they drink their water, when they eat their food, and even when they are happy to see their owners. Even though the drool might not seem like a big deal, it can be if owners don't have a towel ready to clean it up. If that drool dries up into the folds of their skin, it can lead to infections.Neapolitan Mastiffs have a lot of fur, but that doesn't mean that it is harder to brush them. They barely shed, so giving a quick brushing once a week is good enough for this breed.As with every other breed, Neapolitan Mastiffs need their teeth brush and the rest of their bodies checked regularly to avoid problems down the line. Besides hip and other joint issues that most big dogs deal with, an eye condition known as Cherry Eye is quite common with this breed. This condition causes the dog's third eyelid to become inflamed and can cover almost the whole eye. The inflamed eyelid can be removed as long as it is done early on.Neapolitan Mastiffs have shorter lifespans than most other breeds. Most live around 10 years, but there are some cases where they live a bit longer or a bit shorter than that. Believe it or not, Neapolitan Mastiffs can fit in just about any environment. 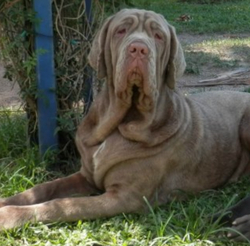 They just need owners who care about them and will keep them from getting overheated in the warmer months.Potential owners should know beforehand that the Neapolitan Mastiff is one of the more expensive dogs to take care of. Someone who has the money to buy a lot of food each month for this breed and is prepared to deal with medical bills down the line will be a great fit.It may not seem like it but this is a good breed for a first-time dog owner. As long as owners a home bigger than a small apartment and are willing to walk them every day, it can definitely be a great dog for someone who wants a guard dog or a family pet.Even though Neapolitan Mastiffs don't need to go on adventures in the car very often, it is a good idea if the owner has a bit of space in their vehicle for this breed to be comfortable. They may not be going on a lot of rides in the car, but it still may need to be used in emergency situations. Training is very important with this breed, so people who want a Neapolitan Mastiff but are not willing to take the time to train them correctly are not a good fit. An untrained Neapolitan Mastiff can cause major damage, so it is not a breed that should go to someone who is not ready to properly train this breed.Neapolitan Mastiffs are also a bad fit for people who don't have the time to give them the attention that they need to be mentally healthy. They become very attached to their owners, so it's unfair to the dog if they aren't given the bonding time that they desire. Owners who know that their dogs will be kept at home alone most of the day should look at other breeds. 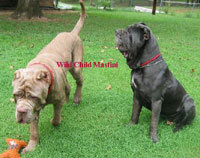 Even though Neapolitan Mastiffs are massive, they are a great fit for many families and even single individuals. It's a beautiful breed that is a natural guard dog, but is also a great social animal when brought up the right way. Neapolitan Mastiffs may not be the most popular breed in the world, but there are certainly many owners who will say that they are some of the most well-rounded dogs in existence today.